The oldest Greek oracle and location of the landing place of the ark in Greek mythology. Priestesses and priests in the sacred grove interpreted the rustling of the oak (or beech) leaves to determine the correct actions to be taken. Originally a shrine to the mother goddess Gaia or Dione, Dodona came to be shared by Zeus who's consort became Dione. There were no permanent structures when Homer wrote the Iliad around 750 BC, at Dodona until the 4th century BC. Herodotus accounts of the origin of Dodona. Herodotus records two different accounts for the origin of Dodona. He wrote firstly that he was told by priests at Egyptian Thebes (Karnak) that "two priestesses had been carried away from Thebes by Phoenicians; one, they said they had heard was taken away and sold in Libya, the other in Hellas; these women, they said, were the first founders of places of divination in the aforesaid countries." This story suggests that the oracles at the oasis of Siwa in Libya and of Dodona in Epirus were equally old, but similarly transmitted from Egypt by Phonecians, and that the priestesses were women. Herodotus also recorded what he was told by the prophetesses, called peleiades ("doves") at Dodona which was that 'two black doves had come flying from Thebes in Egypt, one to Libya and one to Dodona; the latter settled on an oak tree, and there uttered human speech, declaring that a place of divination from Zeus must be made there; the people of Dodona understood that the message was divine, and therefore established the oracular shrine. The dove which came to Libya told the Libyans (they say) to make an oracle of Ammon; this also is sacred to Zeus. Such was the story told by the Dodonaean priestesses, the eldest of whom was Promeneia and the next Timarete and the youngest Nicandra; and the rest of the servants of the temple at Dodona similarly held it true'. According to Herodotus, the oracle was a woman who interpreted the rustling of the wind in the oak trees as well as the sounds of copper vessels being struck. Like the Pythia at Delphi, the oracle was fabled to enter a trance-like frenzy while delivering her responses to questions written on lead tablets. Dodona and the Oracle Octave: Geodetic Placement. Having mentioned that Herodotus associated the origin of Dodona with Thebes in Egypt (above), it is of interest that both sites have been proposed to have been located according to an apparently deliberate geodetic placement of sacred temples and shrines. Dodona is the Mythological landing place for Deucalion after the flood, while Ararat is known in Hebraic as the landing place of the Ark for Noah. 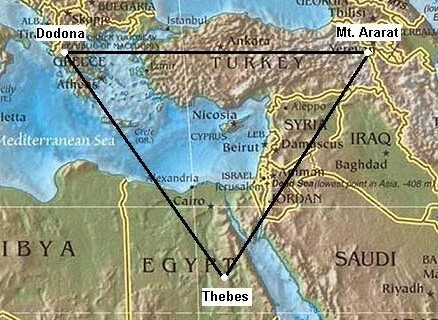 Apart from this early mythological connection between sites, there is a geographical similarity in that both have ancient oracle centres to the earth-mother placed next to dominant mountains and the distance between them is the same as the distance between Dodona and Thebes, so that the three sites form an almost exact equilateral triangle . In the Case of Dodona which lies at 39° 32' 47" N, 20° 47' 16" E, it was suggested by Stecchini ( ), that its location was in accordance to a larger system of deliberate geodetic placement of oracle sites. including Delphi, Dodona and Delos, and other important sites in both Greece and the Middle-east. 'Stecchini maintains that the iconographically consistent presence of pairs of pigeons, perched on, or on either side of, the omphaloi , or "navels," of the ancient world, are an indication of their function as the measurers of the geodetic absolute center. He adds, that, "from prehistoric times" ... "carrier pigeons [were] used for establishing geographic distances. According to Greek legends, a central geodetic point was obtained by loosing two birds of equal strength and using the mean of the time employed in flight. This would allow for differences in wind current and other variables. By repeated flights even more accurate measurements could be obtained. In ancient literature and iconography the flight of two doves is the standard symbol for the stretching of meridians and parallels. 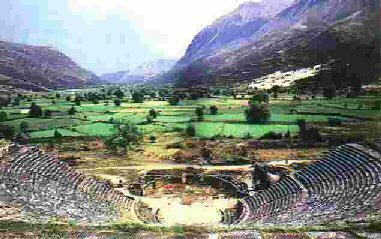 In addition to having been recorded as the first Greek oracle centre, Dodona has a still greater, and older claim to fame being located at the foot of Mount Tomaros, which is named in Greek myth as the refuge for Deucalion and his wife, the sole survivors of the great ‘flood of Deucalion’. It is within this myth that an older, perhaps hidden significance (and connection), can be found in the location of Dodona, for while Mt. Tomaros is the reputed resting place of the Greek ark, the Hebrews record the final resting place of their ark as being on Mount Ararat in Turkey (near Metsamor), which both sits on the same latitude as Dodona and happens to be equidistant from Thebes, so that the three locations form an almost perfect equilateral triangle. It is also interesting to note the location of the 30th parallel in connection to this triangle, as it runs across it a third of the way its height. (See Appendix B for further details). Having already seen that certain prominent sacred sites from Northern (Lower) Egypt share a geometric and geodetic connection with the region of Mount Ararat, we can see now that Thebes, the geodetic centre of Southern (Upper) Egypt, also shares a similar relationship. The accuracy between the locations of these three important sites lends favour to Stecchini’s suggestion of a deliberate placement of ancient oracle centres. It is also apparent that as well as having a geometric relationship, a geodetic one can be seen at both Egyptian sites (namely, Heliopolis being on the 30th parallel in the North, and Thebes being located exactly 2/7th’s of the distance from the Equator to the North pole). While it is possible that such a geometric connection between sites may be a coincidence, the earlier mythological connections (of earth-mother and ark) are harder to explain. It is not possible to know if the significance of the site was already known to the Egyptian priests at Thebes (or Phoenicians) when the oracle at Dodona was established, but there is little doubt that the location had a special significance from before the arrival of the Egyptian oracles. A s if to confirm that the placement of sacred sites was ordained through geodetic principles, a look at the most famous of all Greek oracle centres brings us to the one at Delphi which contains a tradition of geodesy in its origin myth, which says that it was located by Zeus who released two birds from the eastern and western ends of the earth, with the point where they flew past each other being considered the centre of the world and therefore marked with an omphalus stone. As well as being located almost exactly one degree south of Dodona, it also happens to be placed 3/7th’s of the distance from the equator to the North Pole. 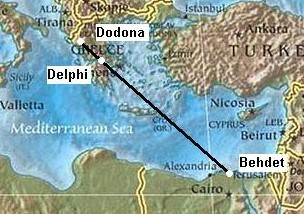 Delphi also lies along the same alignment formed by connecting Dodona to Behdet in Egypt (which was the geodetic capital of Northern Egypt before 3,000 BC according to Stecchini), and which sits on the same longitude as Thebes and the same Latitude as Alexandria. It is noticeable that as well as forming an alignment, these three oracle sites are separated by almost exact degrees of latitude (based on a division of 360°). The oracle centre at Delos also had an omphlus (with a serpent wrapped round it), and we can see that it too was located almost exactly one degree south of Delphi. It is sufficient for present to demonstrate the strength of the connection between the regions of Mt. Ararat and that of Dodona, both sharing the same mythological ‘fingerprint’, both on the same latitude, and both equally distanced from Thebes, the ancient navel of Egypt. However, it is clear from Santillana’s work that there is evidence of a complex set of traditions involving the following themes: Navel-stones, Geometry and Astronomy and a flood event. Omphalos stones from Left to Right: Delphi, Delos, Karnak. We have already seen that the two sites for the landing of the ark are geometrically connected; this reference to the ark leads us neatly to the aspect of navel stones, which were famously found at both Thebes in Egypt and at Delphi (two). In order to understand the significance of the oracle centres it has been necessary to look at the myths that surround them, this proves to be the case with the Omphalii too. Having already determined the existence of an ancient geometric relationship between Dodona and Mt. Ararat (Metsamor), it is interesting to find that Stecchini (1), offers several examples to support the association between navel-stones and ‘the flood’ by referring to their function as ‘plugs’; an idea typified by the following phrase “The opening of the navel brings the deluge”. However of even greater interest is that we see in ‘Hamlet’s Mill’ (5), that certain common subject matter has been approached but through a different medium, namely mythology. The primary emphasis of their research was the existence of an ancient system of astronomical/ astrological knowledge involving the precession of the equinoxes, and the constellations, stored in mythologies around the world. It is from their work we are made aware of a significant set of stories concerning the purpose of navel-stones, through which such already described associations are reinforced. In the Sumerian myth of Utnapishtim (Noah), we are told that the first ark was ‘a cube measuring 60x60x60 fathoms’, which represents the unit in sexagesimal system (where 60 is written as 1 or 1³ ). In one version, we are told that ‘there is no ark, just a cubic stone, which rests on a pillar which reaches from earth to heaven’. In the Old Testament, these elements are repeated, when we learn that Noah’s ark was also a cube, whose landing symbolised the end of the great flood. In Jewish legends, it is said that “since the ark disappeared there was a stone in its place…which was called the foundation stone”…and it is said to lie above the waters that are below the Holy of Holies. In Mecca, the navel of the Islam faith, there stands the Holy stone of the Ka’aba, which is also a cube, and we are told that even Christ is compared to ‘a cube shaped mountain’. But why a cube? Apart from the obvious fact that a cube represents a single unit (as in the Sumerian base-6), the traditional reason for the cube-shape is suggested as being the shape designated for the planet Saturn, as illustrated in Keplers ‘Mysterium Comographicum’. To support this idea Santillana reminds us that in this group of stories, the figure (power) who warns ‘Noah’ of the impending flood, (and suggests the dimensions of the Ark), is ‘…Saturn, as Jehovah, as Enki, as Tane, etc…’. The antiquity of these traditions is shown by the fact that In pre-Islamic days, before the Ka’aba was constructed, there was a well on the site, which had a statue of the ‘God’’ Hubal, across the opening ‘to prevent the waters from rising’. Hildegard Levy points out that, in pre-Islamic days, the god Hubal was Saturn, and that the Holy stone of the Ka’aba served the same symbolic function (5). 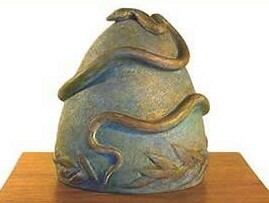 Having touched upon the idea that the traditions and symbolism of the Greek Oracle centres have several stark similarities to earlier pagan deities, it is also possible to see that the comparatively unknown ‘Eleusian mysteries’ are also associated with the exact same deities (or versions of them). In fact, these similarities are so strong that it is difficult to ignore the possibility that they are both part of the same belief system. In addition, we are offered support for the idea of a relationship between the placement of ancient Greek locations, the application of longitude/latitude and the Eleusian mysteries from a Frenchman called Xavier Guichard. 4). Aristotle. 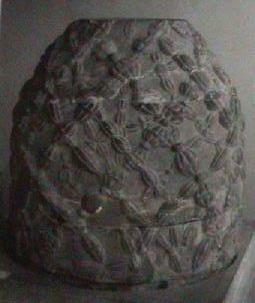 Meteorologica. Book 1, Part 14. 5). Giorgio de Santillana, H. Von Dechend. Hamlets Mill. 1977. David R. Godine Publ. 6). Anneli S. Rufus and Kristan Lawson, Goddess Sites: Europe (San Francisco: Harper San Francisco A Division of Harper Collins Publishers, 1991), p.137.